After Matrix Yachts’ president, Peter Wehrley, retired from his job as a structural engineer to operate charter boats in the Caribbean with his wife, Fiona, they soon saw the potential for a large catamaran in the charter trade. Peter’s son, Mark, also captains boats in the charter trade and has now joined the family firm. The Wehrleys’ extensive sailing experience is readily apparent in the Vision 450’s systems, layout and style. Matrix Yachts developed the Vision 450 to complement its Silhouette 760 and the soon-to-be launched Mirage 720 day-charter cat. Designed for both private owners and the bareboat charter market, the 450 shares many features with the Silhouette: nearly plumb stems, large swim platforms in the transoms and an elegantly styled deckhouse. The similarities continue below, and the Vision’s spacious interior has a high-quality feel throughout. After Matrix Yachts’ president, Peter Wehrley, retired from his job as a structural engineer to operate charter boats in the Caribbean with his wife, Fiona, they soon saw the potential for a large catamaran in the charter trade. The result was the first Silhouette, which came out in 2004. Peter’s son, Mark, also captains boats in the charter trade and has now joined the family firm. 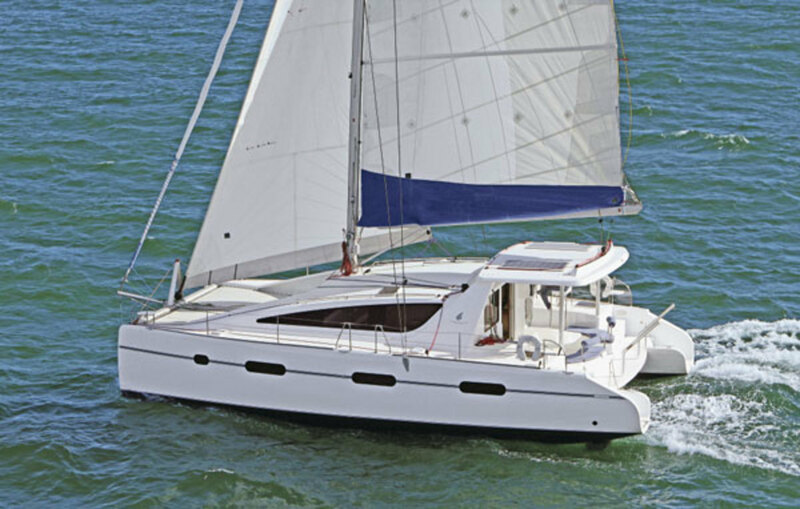 The Wehrleys’ extensive sailing experience is readily apparent in the Vision 450’s systems, layout and style. The hulls of the Vision 450 are vacuum-bagged using vinylester resin, E-Glass and PVC foam core. Decks are cored with balsa. An isophthalic gelcoat helps prevent osmotic blistering. All interior paneling is skinned-over Corecell. The resulting structure is strong, rigid and light. The solid-glass keels are attached separately and are not an integral part of the molded hulls. In the event of a catastrophic grounding, Mark told me, the keels can be easily replaced. They also contain the boat’s freshwater tanks. As someone who occasionally repairs boats, I appreciated that the electrical panel and other systems are located together in a set of central lockers inboard at the foot of the starboard companionway. There’s no need to go searching for a pump or valve. The air conditioning system, the freshwater pump, a bilge pump and a watermaker occupy what on many boats would be a pair of hanging lockers outboard. Lounging space abounds on the full-width trampoline. Three deep lockers make stowing gear and extra sails a breeze, and I was happy to see the windlass shielded from the elements in a small centerline locker just aft of the tramp. Stylish cabin fairings will block a cool breeze if you get chilly while lying out on the bridgedeck, but they also are a bit of an obstacle when going to the mast. Six to eight crewmembers will be comfortable dining al fresco in the cockpit beneath a raised hardtop. A fairly high sill between the cockpit and saloon will keep water out when the spray is flying, and a drain at the forward end of the cockpit will shuttle the moisture back where it belongs. Stowage is well thought out, with lockers to either side, each big enough to fit four dive tanks and a shower hose. Abundant seat lockers will swallow up other cruising necessities. Solar panels on the hardtop provide enough juice to power the 12-volt cockpit refrigerator under one seat, so you can leave it on all the time, ensuring that you’ll have a cold beverage to greet you when you arrive at the boat. Forward and starboard in the cockpit, the raised two-person helm seat affords the skipper a view around the boat, as well as of the sails through a cutout in the hard top. On the Vision 450, the helm position is lower than on many cats, which makes it easier for watch-standers to socialize with the crew in the cockpit and also provides a better view of the jib. Stepping through the sliding cockpit doors, I was struck by how inviting the saloon looks. The sole is a dark cork complemented by golden cherry laminate and trim on the furniture and galley counters. The cabin soles in the hulls is a teak-and-holly laminate. An L-shaped settee takes up almost the entire width of the saloon, stretching from a dinette table to starboard to an outward-facing nav desk to port. 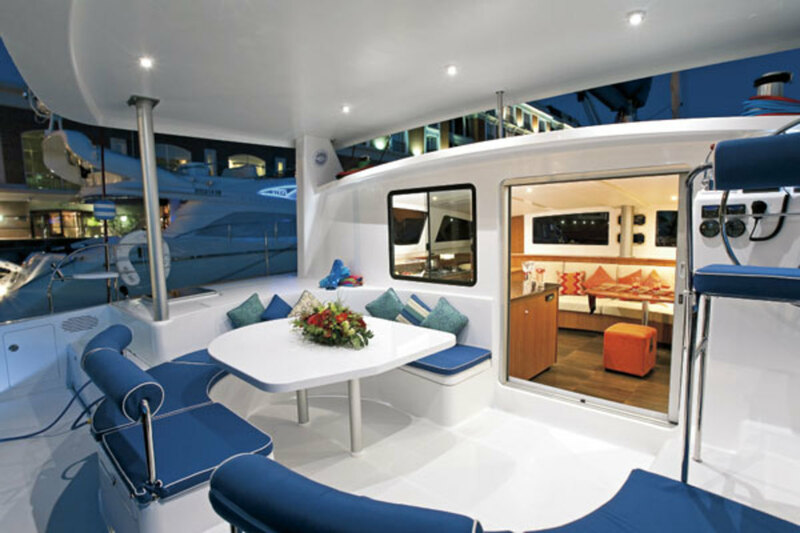 A pair of padded stools allows six to sit comfortably around the table, while the nav desk provides extra working space for the already commodious U-shaped galley just aft. A four-burner range is separate from the large oven beneath it, and a recessed drying basin for dishes sits next to the aft-facing double sink. A pair of hatches in the deckhead and a pair of centerline opening ports let into the vertical windows forward provide excellent ventilation. In the four-cabin version I sailed, the hull layouts mirror each other, with fore-and-aft crawl-in king-size berths in the aft cabins surrounded by padded synthetic suede liners. 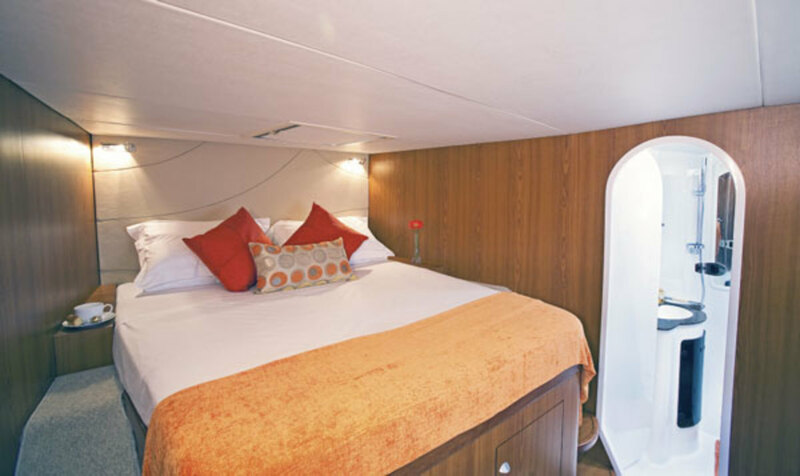 The forward cabins each feature an athwartships queen-size berth, with access from both sides, and lockers under and opposite the foot. In the three-cabin layout, the entire starboard hull is given over to an owner’s cabin, which includes a settee and small office. Simply put, the Vision 450 is fun to sail. There’s good feedback at the helm, the boat easily topped the true windspeed of 7.5 knots, accelerating from 2.8 knots under its big-roached full-batten main to 8.2 knots after we unrolled the gennaker on its Facnor furler. The main halyard is led through an Easylock clutch to a Harken electric winch. The genoa is set from a Harken furler, with sheets led along both sides of the cabinhouse to the forward edge of the cockpit. The main is set on a Harken Battcar system. Departing the marina, Mark Wehrley deftly spun the boat about using its twin 29hp Yanmar engines. In smooth water, they pushed us along at 7.6 knots at 2,800 rpm, though in fairness to the builder, I should note that the boat’s bottom hadn’t been cleaned in three months. The engine rooms themselves are well laid out, with good access to the filters and both sides of the engines.